This article is about the eighteenth-century composer. For other uses, see Handel (disambiguation). George Frideric Handel (German: Georg Friedrich Händel; pronounced [ˈhɛndəl]) (23 February 1685 – 14 April 1759) was a German-British Baroque composer, famous for his operas, oratorios, and concertos. Handel was born in Germany in the same year as Johann Sebastian Bach and Domenico Scarlatti. He received critical musical training in Italy before settling in London and becoming a naturalised British subject. His works include Messiah, Water Music, and Music for the Royal Fireworks. He was strongly influenced by the great composers of the Italian Baroque and the middle-German polyphonic choral tradition. Handel’s music was well-known to composers including Haydn, Mozart, and Beethoven. 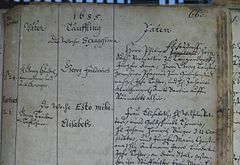 Handel was born in Halle to Georg and Dorothea (née Taust) Händel in 1685,. His father, Georg Händel, 63 when his son was born, was an eminent barber-surgeon who served as surgeon to the court of Saxe-Weissenfels and the Margraviate of Brandenburg. According to Handel’s first biographer, John Mainwaring, he “had discovered such a strong propensity to Music, that his father who always intended him for the study of the Civil Law, had reason to be alarmed. He strictly forbade him to meddle with any musical instrument but Handel found means to get a little clavichord privately convey’d to a room at the top of the house. To this room he constantly stole when the family was asleep“. At an early age Handel became a skillful performer on the harpsichord and pipe organ. 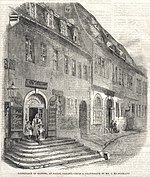 Handel and his father traveled to Weissenfels to visit either Handel’s half-brother, Carl, or nephew, Georg Christian, who was serving as valet to Duke Johann Adolf I. According to legend, the young Handel’s playing on the church organ attracted the Duke’s attention. Handel convinced his father to allow lessons in musical composition and keyboard technique from Friedrich Wilhelm Zachow, the organist of the Lutheran Marienkirche. Handel learned about harmony and contemporary styles, analysed sheet music scores, learned to work fugue subjects, and to copy music. Sometimes he replaced his teacher as organist. In 1698 Handel played for Frederick I of Prussia and met Giovanni Battista Bononcini in Berlin. In 1701 Georg Philipp Telemann went to Halle to listen to the important young man. 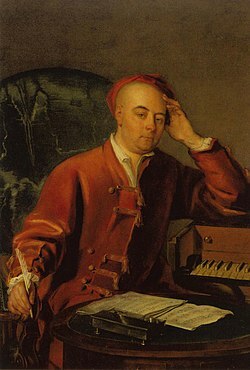 In 1702, following his father’s wishes, Handel started studying law at the University of Halle; and also earned an appointment as the organist at the local Protestant cathedral. After a year Handel seems to have been unsatisfied and in 1703, he accepted a position as violinist and harpsichordist in the orchestra of the Hamburg opera house. There he met Johann Mattheson, Christoph Graupner and Reinhard Keiser. His first two operas, Almira and Nero, were produced in 1705. He produced two other operas, Daphne and Florindo, in 1708. It is unclear whether Handel directed these performances. According to Mainwaring, in 1706 Handel traveled to Italy at the invitation of Ferdinando de’ Medici, but Mainwaring must have been confused. It was Gian Gastone de’ Medici, whom Handel had met in 1703/1704 in Hamburg. Ferdinando had made Florence Italy’s musical capital, attracting the leading talents of his day. He had a keen interest in opera. In Italy Handel met librettist Antonio Salvi, with whom he later collaborated. He had a rumored love affair with Vittoria Tarquini, a singer. Handel left for Rome and, since opera was (temporarily) banned in the Papal States, composed sacred music for the Roman clergy. His famous Dixit Dominus (1707) is from this era. :[24, 26] He also composed cantatas in pastoral style for musical gatherings in the Palace of Cardinals Pietro Ottoboni, Benedetto Pamphili and Carlo Colonna. Two oratorios, La Resurrezione and Il Trionfo del Tempo, were produced in a private setting for Ruspoli and Ottoboni in 1709 and 1710, respectively. Rodrigo, his first all-Italian opera, was produced in the Cocomero theatre in Florence in 1707. Agrippina was first produced in 1709 at Teatro San Giovanni Grisostomo, the prettiest theatre at Venice, owned by the Grimani’s. The opera, with a libretto by cardinal Vincenzo Grimani, ran for an unprecedented 27 performances. It showed remarkable maturity and established Handel’s reputation as a composer of opera. The audience, thunderstruck with the grandeur and sublimity of his style, applauded for Il caro Sassone. In 1710, Handel became Kapellmeister to German prince George, Elector of Hanover, who in 1714 would become King George I of Great Britain. He visited Anna Maria Luisa de’ Medici and her husband in Düsseldorf on his way to London in 1710. With his opera Rinaldo, based on La Gerusalemme Liberata by the Italian poet Torquato Tasso, Handel enjoyed great success, “but it is difficult to see why he lifted from old Italian works unless he was in a hurry”. This work contains one of Handel’s favourite arias, Cara sposa, amante cara. In 1712, Handel decided to settle permanently in England. He received a yearly income of £200 from Queen Anne after composing for her the Utrecht Te Deum and Jubilate, first performed in 1713. 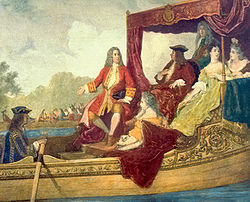 George Frideric Handel (left) and King George I on the River Thames, 17 July 1717, by Edouard Jean Conrad Hamman (1819–88). One of his most important patrons was the young and wealthy Richard Boyle, 3rd Earl of Burlington. For him Handel wrote Amadigi di Gaula, a magical[disambiguation needed] opera, about a Damsel in distress, based on the tragedy by Antoine Houdar de la Motte. Amadigi, employs many machines and spectacles and no voices lower than alto. It ends in a minor key. The conception of an opera as a coherent structure was slow to capture Handel’s imagination and he renounced it for five years. 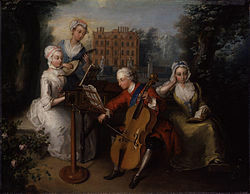 In July 1717 Handel’s Water Music was performed more than three times on the Thames for the King and his guests, such as Anne Vaughan, the Duchess of Bolton, Countess Godolphin, Countess of Darlington and the Earl of Orkney. The barges, heading for Chelsea or Lambeth and leaving the party after midnight, used the tides of the river. The compositions spurred reconciliation between the King and Handel. Handel’s most carefree time was as house composer at Cannons in Middlesex and laid the cornerstone for his future choral compositions in the twelve Chandos Anthems. Romain Rolland stated that these anthems were as important for his oratorios as the cantatas were for his operas. Rolland also esteemed Acis and Galatea, like Winton Dean, who wrote, “the music catches breath and disturbs the memory”. During Handel’s lifetime it was his most performed work. Handel invested in South Sea stock in 1716, when prices were low  and sold before 1720, when the South Sea credit bubble burst in one of history’s greatest financial cataclysms. 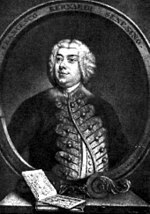 In May 1719 Lord Chamberlain Thomas Holles, the Duke of Newcastle ordered Handel to look for new singers. Handel travelled to Dresden to attend the newly–built opera. He saw Teofane by Antonio Lotti, and engaged the cast for the Royal Academy of Music, founded by a group of aristocrats to assure themselves a constant supply of baroque opera or opera seria. Handel may have invited John Smith, his fellow student in Halle, and his son Johann Christoph Schmidt, to become his secretary and amanuensis. 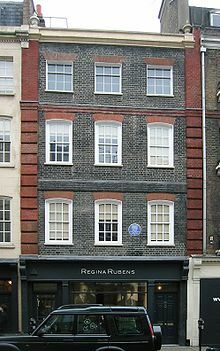 By 1723 he had moved into a Georgian house at 25 Brook Street, which he rented for the rest of his life. This house, where he rehearsed, copied music and sold tickets, is now the Handel House Museum. During twelve months between 1724 and 1725, Handel wrote three outstanding and successful operas, Giulio Cesare, Tamerlano and Rodelinda. Winton Dean acclaimed this an achievement without parallel. Handel’s opera’s are filled with da capo arias, such as Svegliatevi nel core. After composing Silete venti, he concentrated on opera and stopped writing cantatas. Scipio, from which we have the regimental slow march of the British Grenadier Guards  was performed as a stopgap, waiting for the arrival of Faustina Bordoni. In 1727 Handel was commissioned to write four anthems for the coronation ceremony of King George II. One of these, Zadok the Priest, has been played at every British coronation ceremony since. In 1728 John Gay’s The Beggar’s Opera premiered at Lincoln’s Inn Fields Theatre and ran for 62 consecutive performances, the longest run in theatre history up to that time. After nine years Handel’s contract was ended but he soon started a new company. 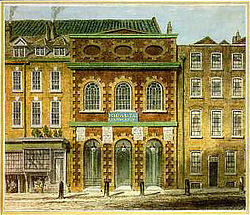 The Queen’s Theatre in Haymarket (now Her Majesty’s Theatre), established in 1705 by architect and playwright John Vanbrugh, quickly became an opera house. Between 1711 and 1739, more than 25 of Handel’s operas premièred there. In 1729 Handel became joint manager of the Theatre with John James Heidegger. Handel travelled to Italy to engage seven new singers. He composed seven more operas, but the public came to hear the singers rather than the music. After two commercially successful English oratorios Esther and Deborah, he was able to invest again in the South Sea Company. Handel reworked his Acis and Galathea which then became his most successful work ever. Handel failed to compete with the Opera of the Nobility, who engaged musicians such as Johann Adolf Hasse, Nicolo Porpora and the famous castrato Farinelli. The strong support by Frederick, Prince of Wales caused conflicts in the royal family. In March 1734 Handel directed a wedding anthem This is the day which the Lord hath made, and a serenata Parnasso in Festa for Anne of Hanover. In 1733 the Earl of Essex received a letter with the following sentence: “Handel became so arbitrary a prince, that the Town murmurs”. The board of chief investors expected Handel to retire when his contract ended, but Handel immediately looked for another theatre. In cooperation with John Rich he started his third company at Covent Garden Theatre. Rich was renowned for his spectacular productions: he suggested Handel use his small chorus and introduce the dancing of Marie Sallé, for whom Handel composed Terpsichore. 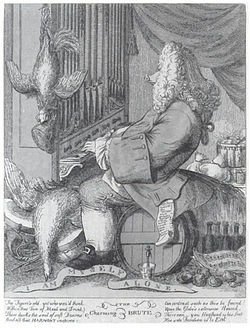 In 1735 he introduced organ concertos between the acts. For the first time Handel allowed Gioacchino Conti, who had no time to learn his part, to substitute arias. Financially, Ariodante was a failure, although he introduced ballet suites at the end of each act. Alcina, his last opera with a magic content, and Alexander’s Feast or the Power of Music based on John Dryden’s Alexander’s Feast starred Anna Maria Strada del Pò and John Beard (tenor). In April 1737, at age 52, Handel apparently suffered a stroke which left his right arm temporarily paralysed, preventing him from performing. In summer the disorder seemed at times to affect his understanding. Nobody expected that Handel would ever be able to perform again. But whether the affliction was rheumatism, a stroke or a nervous breakdown, he recovered remarkably quickly. 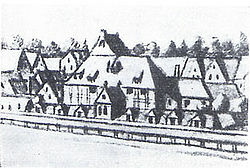 To aid his recovery, Handel had travelled to Aachen, a spa in Germany. During six weeks he took long hot baths, and ending up playing the organ for a surprised audience. Deidamia his last, and only baroque opera without an accompagnato, was performed three times. Having lost a fortune in operatic management, Handel gave up the business in 1741. In the meantime John Walsh published six organ concertos and Twelve Grand Concertos. Handel enjoyed success with his English oratorios. Handel’s first attempt at oratorio was made in Italy in 1707-1708 with the Il Trionfo del Tempo e del Disinganno, an allegory, and La Resurrezione which uses material from the bible. His next attempt was Haman and Mordecai performed at Cannons, in which the anthem character is very clear. Unfortunately the circumstances of Esther and its first performance are obscure. Another twelve years passed when an act of piracy, caused him to take up Ester once again. Three earlier performances aroused such interest that they naturally prompted the idea of introducing it to a larger public. Next came Deborah, also strongly coloured by the anthem and Athaliah, in which Handel laid the foundation for the traditional use of the chorus which marks his later oratorios. Obviously Handel became sure of himself, broader in his presentation, and more diverse in his composition. It is evident how much he learnt from Arcangelo Corelli about writing for instruments, and from Alessandro Scarlatti about writing for the solo voice; but there is no single composer who taught him how to write for chorus. Handel tended more and more to replace Italian soloists by English ones. The weightiest reason for this change was the dwindling financial returns from his operas. Thus a tradition was created for oratorios which was to govern their future performance. The performances were given without costumes and action; the performers appeared in a black suit. In 1736 Handel came with Alexander’s Feast. John Beard appeared for the first time as one of Handel’s principal singers and became Handel’s permanent tenor soloist for the rest of his life. The piece was a great success and it encouraged Handel to make the transition from writing Italian operas to English choral works. In Saul, Handel was collaborating with Charles Jennens and experimenting with three trombones, a carillon and extra-large military kettledrums (from the Tower of London), to be sure “…it will be most excessive noisy”. Saul and Israel in Egypt both from 1739 head the list of great, mature oratorios, in which the da capo and dal segno aria became the exception and not the rule. Israel in Egypt consists of little else but choruses, borrowing from the Funeral Anthem for Queen Caroline. In his next works Handel changed his course. In these works he laid greater stress on the effects of orchestra and soloists; the chorus retired into the background. L’Allegro, il Penseroso ed il Moderato has a rather diverting character; the work is light and fresh. During the summer of 1741, the 3rd Duke of Devonshire invited Handel to Dublin to give concerts for the benefit of local hospitals. His Messiah was first performed at the New Music Hall in Fishamble Street, on 13 April 1742, with 26 boys and five men from the combined choirs of St Patrick’s and Christ Church cathedrals participating. Handel secured a balance between soloists and chorus which he never surpassed. The use of English soloists reached its height at the first performance of Samson. The work is highly theatrical. Jephtha was first performed on 26 February 1752; even though it was his last oratorio, it was no less a masterpiece than his earlier works. In 1749 Handel composed Music for the Royal Fireworks; 12,000 people attended the first performance. In 1750 he arranged a performance of Messiah to benefit the Foundling Hospital. The performance was considered a great success and was followed by annual concerts that continued throughout his life. In recognition of his patronage, Handel was made a governor of the Hospital the day after his initial concert. He bequeathed a copy of Messiah to the institution upon his death. His involvement with the Foundling Hospital is today commemorated with a permanent exhibition in London’s Foundling Museum, which also holds the Gerald Coke Handel Collection. In addition to the Foundling Hospital, Handel also gave to a charity that assisted impoverished musicians and their families. In August 1750, on a journey back from Germany to London, Handel was seriously injured in a carriage accident between The Hague and Haarlem in the Netherlands. In 1751 one eye started to fail. The cause was a cataract which was operated on by the great charlatan Chevalier Taylor. This led to uveitis and subsequent loss of vision. He died eight years later in 1759 at home in Brook Street, at age 74. The last performance he attended performed Messiah. Handel was buried in Westminster Abbey. More than three thousand mourners attended his funeral, which was given full state honours. Handel’s compositions include 42 operas, 29 oratorios, more than 120 cantatas, trios and duets, numerous arias, chamber music, a large number of ecumenical pieces, odes and serenatas, and 16 organ concerti. His most famous work, the oratorio Messiah with its “Hallelujah” chorus, is among the most popular works in choral music and has become the centerpiece of the Christmas season. Among the works with opus numbers published and popularised in his lifetime are the Organ Concertos Op.4 and Op.7, together with the Opus 3 and Opus 6 concerti grossi; the latter incorporate an earlier organ concerto The Cuckoo and the Nightingale in which birdsong is imitated in the upper registers of the organ. Also notable are his sixteen keyboard suites, especially The Harmonious Blacksmith. 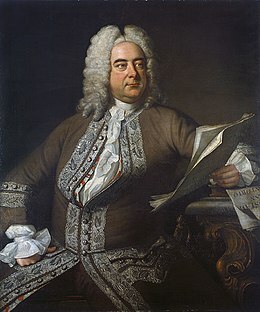 Handel introduced previously uncommon musical instruments in his works: the viola d’amore and violetta marina (Orlando), the lute (Ode for St. Cecilia’s Day), three trombones (Saul), clarinets or small high cornets (Tamerlano), theorbo, horn (Water Music), lyrichord, double bassoon, viola da gamba, bell chimes, positive organ, and harp (Giulio Cesare, Alexander’s Feast). Handel’s works have been catalogued in the Händel-Werke-Verzeichnis and are commonly referred to by an HWV number. For example, Messiah is catalogued as HWV 56. After his death, Handel’s Italian operas fell into obscurity, except for selections such as the aria from Serse, “Ombra mai fù“. Throughout the 19th century and first half of the 20th century, particularly in the Anglophone countries, his reputation rested primarily on his English oratorios, which were customarily performed by enormous choruses of amateur singers on solemn occasions. Since the 1960s, with the revival of interest in baroque music, original instrument playing styles, and the prevalence of countertenors who could more accurately replicate castrato roles, interest has revived in Handel’s Italian operas, and many have been recorded and performed. Since the Early Music Revival the fifty operas he wrote have been performed in opera houses and concert halls. Recent decades have revived his secular cantatas and what one might call ‘secular oratorios’ or ‘concert operas’. Of the former, Ode for St. Cecilia’s Day (1739) (set to texts by John Dryden) and Ode for the Birthday of Queen Anne (1713) are noteworthy. 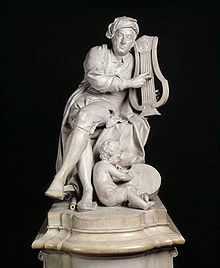 For his secular oratorios, Handel turned to classical mythology for subjects, producing such works as Acis and Galatea (1719), Hercules (1745) and Semele (1744). These works have a close kinship with the sacred oratorios, particularly in the vocal writing for the English-language texts. They also share the lyrical and dramatic qualities of Handel’s Italian operas. As such, they are sometimes performed onstage by small chamber ensembles. With the rediscovery of his theatrical works, Handel, in addition to his renown as instrumentalist, orchestral writer, and melodist, is now perceived as being one of opera’s great musical dramatists. A carved marble statue of Handel, created for the Vauxhall Gardens in 1738 by Louis-François Roubiliac, and now preserved in the Victoria & Albert Museum. 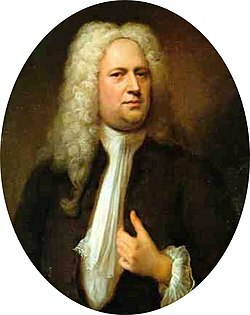 Handel’s works were edited by Samuel Arnold (40 vols., London, 1787–1797), and by Friedrich Chrysander, for the German Händel-Gesellschaft (100 vols., Leipzig, 1858–1902). Handel adopted the spelling “George Frideric Handel” on his naturalisation as a British subject, and this spelling is generally used in English-speaking countries. The original form of his name, Georg Friedrich Händel, is generally used in Germany and elsewhere, but he is known as “Haendel” in France. Another composer with a similar name, Handl, was a Slovene and is more commonly known as Jacobus Gallus. Handel has generally been accorded high esteem by fellow composers, both in his own time and since. Bach attempted, unsuccessfully, to meet with Handel while he was visiting Halle. Mozart is reputed to have said of him, “Handel understands affect better than any of us. When he chooses, he strikes like a thunder bolt.” To Beethoven he was “the master of us all… the greatest composer that ever lived. I would uncover my head and kneel before his tomb”. Beethoven emphasised above all the simplicity and popular appeal of Handel’s music when he said, “Go to him to learn how to achieve great effects, by such simple means”. After Handel’s death, many composers wrote works based on or inspired by his music. The first movement from Louis Spohr‘s Symphony No. 6, Op. 116, “The Age of Bach and Handel”, resembles two melodies from Handel’s Messiah. In 1797 Ludwig van Beethoven published the 12 Variations in G major on ‘See the conqu’ring hero comes’ from Judas Maccabaeus by Handel, for cello and piano. Guitar virtuoso Mauro Giuliani composed his Variations on a Theme by Handel, Op. 107 for guitar, based on Handel’s Suite No. 5 in E major, HWV 430, for harpsichord. In 1861, using a theme from the second of Handel’s harpsichord suites, Johannes Brahms wrote the Variations and Fugue on a Theme by Handel, Op. 24, one of his most successful works (praised by Richard Wagner). Several works by the French composer Félix-Alexandre Guilmant use Handel’s themes, for example his March on a Theme by Handel uses a theme from Messiah. French composer and flautist Philippe Gaubert wrote his Petite marche for flute and piano based on the fourth movement of Handel’s Trio Sonata, Op. 5, No. 2, HWV 397. Argentine composer Luis Gianneo composed his Variations on a Theme by Handel for piano. In 1911, Australian-born composer and pianist Percy Grainger based one of his most famous works on the final movement of Handel’s Suite No. 5 in E major (just like Giuliani). He first wrote some variations on the theme, which he titled Variations on Handel’s ‘The Harmonious Blacksmith’ . Then he used the first sixteen bars of his set of variations to create Handel in the Strand, one of his most beloved pieces, of which he made several versions (for example, the piano solo version from 1930). Arnold Schoenberg‘s Concerto for String Quartet and Orchestra in B flat major (1933) was composed after Handel’s Concerto Grosso, Op. 6/7. Handel is honored together with Johann Sebastian Bach and Henry Purcell with a feast day on the liturgical calendar of the Episcopal Church (USA) on 28 July. He is commemorated as a musician in the Calendar of Saints of the Lutheran Church on 28 July, with Johann Sebastian Bach and Heinrich Schütz. ^ Adams Aileen, K., Hofestadt, B., “Georg Handel (1622–97): the barber-surgeon father of George Frideric Handel (1685–1759)”, Journal of Medical Biography, 2005, Aug; 13(3):142–49. ^ There is a tantalising suggestion by Handel’s biographer, Jonathan Keates, that he may have come to London in 1710 and settled in 1712 as a spy for the eventual Hanoverian successor to Queen Anne. ^ Dean 2006, p. 226According to Dean they could not have reached London before 1716. In 1743, Smith wrote in a letter that he had been in Handel’s service for 24 years. ^ For new insights on this episode, see Ilias Chrissochoidis: “Handel Recovering: Fresh Light on his Affairs in 1737”, Eighteenth-Century Music 5/2 (2008): 237–44. ^ Larsen 1972, p. 15 Handels Messiah. A distinguished authority on Handel discusses the origins, composition, and sources of one the great choral works of western civilization. ^ a b Young, Percy Marshall (1 April 1975) . Handel (Master Musician series). J.M.Dent & Sons. pp. 254. ISBN 0-4600-3161-9. Chrissochoidis, Ilias. “Early Reception of Handel’s Oratorios, 1732–1784: Narrative – Studies – Documents” (Ph.D. dissertation, Stanford University, 2004), available through UMI. Chrissochoidis, Ilias. “Handel at a Crossroads: His 1737–1738 and 1738–1739 Seasons Re-Examined“, Music & Letters 90/4 (November 2009), 599–635. Chrissochoidis, Ilias. “Handel, Hogarth, Goupy: Artistic intersections in Handelian biography“, Early Music 37/4 (November 2009), 577–596. Chrissochoidis, Ilias. “‘hee-haw … llelujah’: Handel among the Vauxhall Asses (1732)“, Eighteenth-Century Music 7/2 (September 2010), 221–262. Dean, Winton; Knapp, John Merrill (1987). Handel’s Operas, 1704–1726. Oxford: Clarendon Press. ISBN0-19-816441-6. Dean, Winton (2006). Handel’s Operas, 1726–1741. The Boydell Press. http://www.boydell.co.uk/43832682.HTM. Dent, Edward Joseph (2004). Handel. R A Kessinger Publishing. ISBN1-4191-2275-4. Keates, Jonathan (1985). Handel, the man and his music. New York: St Martin’s Press. Larsen, J.P. (1972). Handel’s Messiah. London: Adams and Charles Black Limited. The Mutopia Project provides free downloading of sheet music and MIDI files for some of Handel’s works. This entry was posted on 2 March 2011 by nanang basuki santoso. It was filed under Music and was tagged with George Frideric Handel.